One of the best things about 3D printers is that once you get one, you are able to start printing modifications and upgrades for your own device using the printer itself. 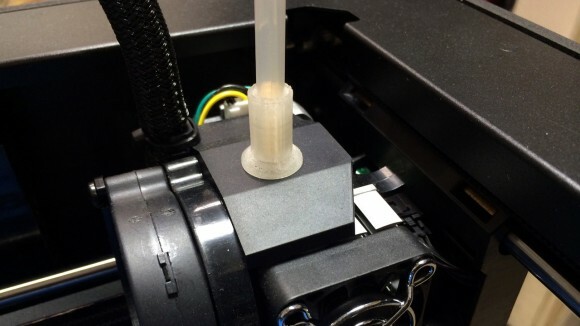 Regardless of how good or expensive the 3D printer is there are usually some things that you can further improve or just make your life easier by printing some additional parts that might extend the device’s functionality. You don’t need to even design the parts yourself as many of them are already available for direct printing, at least for the Makerbot Replicator 2 printer (including many compatible models) that we use. In fact we have already printed some upgrades for our Replicator 2 3D printer that we are using and are very happy with, apart from the upgrades that cannot be directly printed, but need to be bough separately or to be made using different hardware. Upgrades like a holder for the filament guide tube, or a better spool holder for non-standard spools with filament can save you from unsuccessful prints. Other upgrades such as upgrading the extruder filament feed mechanism or adding build plate holders can result in better quality prints. There are other upgrades that you can also find useful such as SD card or tool holders, camera holders for recoding the build process and so on and so on. Not to mention that you can also print upgrades that are purely for visual tuning and upgrades that can also be fun as they will allow you to personalize the 3D printer.